Yesterday I posted a lovely email I received from a mom about how much success she achieved in ONE DAY with her late talker by becoming more fun and tweaking their daily routine of bath time. If you missed that post, you can read it here. Here’s a follow up question she sent and my reply. To answer your questions – keep him engaged as long as it feels right to you and you’re both having fun, but do help him switch gears and move on to a very similar activity, especially since he has difficulty with transitions. I think 20 minutes on one fun game is a good benchmark for you to use. You DO want him to develop a nice attention span when he’s including you. Rushing on to the next thing too quickly is as much of a problem as poor transitions are! You want to develop that nice “happy medium” time span. 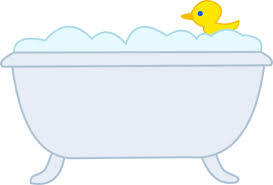 Since his attention is good in the tub, you can introduce all kinds of new games there. I love your clapping and exclamatory words and his brand new words “yay” and “again.” Good job Momma!! Be sure to add a couple of new gestures this week for him to copy at bathtime. I’d start with him giving you a “High 5” or exaggerated showing of a toy with some new fun words too like “Wow!” and “Look!” during showing and “Uh oh” as the animals splash. You have a good list of things to try in the Building Verbal Imitation book with the chart on the back page. This can be your cheat sheet while you’re playing. Don’t try to do all of those things at once either – just add one or two new words or gestures to copy per routine every 3 or 4 days. Make sure you give him plenty of time to practice “again” and “yay” and all of his other new words too. You want him to “own” those words and repetition and practice are the only ways to accomplish mastery. Keep it super fun and fairly fast-paced so you don’t lose him. If he HATES this routine or if it’s hard, you could just pick up a toy, say it’s name, and then “THROW!” or “IN!” as you toss it in the bag for a few days until he gets the hang of it. Then you could try asking him to find specific toys again to see if it works better after you get the routine going. Keep singing your songs too from the book to help with the final transition – meaning as you’re getting ready to pick him up from the tub. Songs DO work wonders for toddlers with transitions because you’re teaching them to anticipate what comes next and the singing helps distract or redirect their attention. Another thing that helps is to always make the step after the dreaded transition fun. When my children (now 25, 23, and 18!) hated getting out of the tub, I scooped them up in a towel and shook them around or ran with them to (gently) toss them on the bed to dry off and get those pajamas on to get ready for bed. When they didn’t want to come in from outside, I always talked about what was waiting inside – a cup of their favorite drink, a popsicle, a movie, whatever would make them “forget” about being upset. IF SHE CAN DO IT, ANY MOM CAN DO IT! If you’re in this same situation, parenting a late talker, take this as inspiration and make a commitment TODAY to tweak a few of your routines by being FUN and PLAYFUL while you focus on language. If you need direct guidance for how to do that, check out my links below. 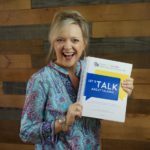 If you’re a therapist who works with late talkers, then YOU have to teach the moms and dads you work with HOW to make these changes. They need to see you being fun and playful so they can copy your model. In addition to showing them how to to do it, include very specific ideas like I’ve done for this mom. Parents CRAVE this kind of direct teaching. They WANT you to teach them how to do it. Don’t believe anyone who tells you otherwise!! 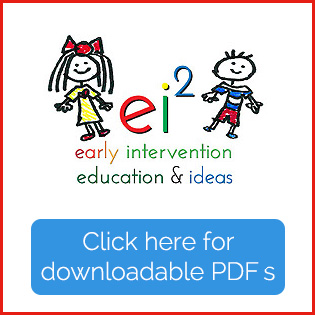 If you need some direction learning exactly what to teach parents, my resources can help you too! 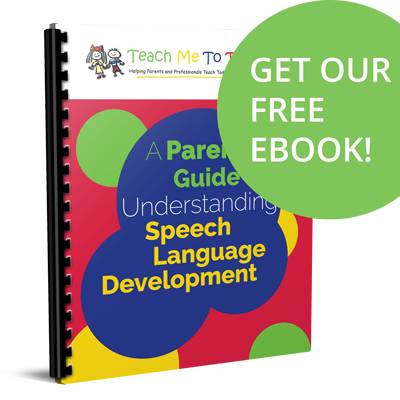 Building Verbal Imitation in Toddlers – book to teach you HOW to teach a child to imitate words – it’s a process! ← A Tweak Here and There Can Make a BIG Difference! IT WAS VERY motivating ,,,,,and i like the part of laura also encouraging everybody .,,,,PLEASE KEEP SHARING THESE POSTS LAURA ,,,,IT IS A GREAT HELP ,.,,,,,GOD BLESS LAURA …. I have been “following you” for a long time now. I recently received your IS IT AUTISM? videos ad love them. I am a speech therapist , a very experienced one !! Well over 40 years experience and still loving it! And still learning! We are so lucky to have this profession we love! Reading this super mom’s email to you reminded me of an old game we have been playing after bath time in our family. It started with my eldest daughter who is now 45 and we are still doing it with our youngest grandchild who is two years old. Great for that transition! We ask: Do you want Sack of Potatoes? Oh yes, up they jump. We wrap them up completely from head to toes in a large bath towel and sing in a sing-song voice: Sack of potatoes for sale! Who wants potatoes? Then gently drop them on our bed and dry them while gently but firmly “pinching knees, elbows head etc. and saying here is a potato, another potato, more potatoes… Who doesn’t want to get out of the bath tub with that fun in store? Keep up your great work and endless energy!